Next week, demonstrators will gather at a meeting of the World Wide Web Consortium (W3C) in Lisbon, Portugal. They will make the same demand that we made at the last major W3C meeting in March: stop streaming companies from inserting Digital Restrictions Management (DRM) into the HTML standard on which the Web is based. The protest is organized by two Portuguese organizations, ANSOL (Associação Nacional para o Software Livre) and AEL (Associação Ensino Livre), which work in the area of free software and technological literacy. For those who live near Lisbon and would like to join the protest, details and contact information are in the organizers' press release. Defective by Design campaign organized a similar protest at the W3C's last meeting, which took place at the Massachusetts Institute of Technology (MIT) in March. It was the first ever political demonstration at a W3C event. In the week before the protest, Dutch activists held their own demonstration at the Amsterdam W3C office, and a Brazilian Web expert met with staff at the W3C office in São Paulo. The W3C felt the pressure. 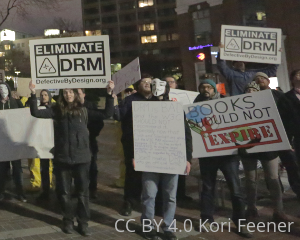 The night of the protest, its leadership released an FAQ that attempted to justify its involvement with DRM despite overwhelming public criticism. In addition to preventing people from sharing media, DRM often causes security vulnerabilities or disappearing or inaccessible files. It treats users as adversaries, creating a black box inside their computers that they cannot access, though the DRM's owners can. Few outside the entertainment industry like DRM, and many agree it is ethically wrong, but the W3C, which sets official Web standards, has allowed streaming video companies to work on a new, universal DRM system together with its blessing. It's called EME, for Encrypted Media Extensions. Now Netflix, Microsoft, Google, and Apple want to hang their new EME on the existing infrastructure of the HTML standard, making it cheaper and easier to impose restrictions on users. Even though support for EME is limited to a few powerful companies, opposition is global. The fact that the W3C is being followed around the world by protests demonstrates this, as do the 34,712 people who signed our petition against Encrypted Media Extensions, and the scores who were bold enough to sign it with their faces. We hope the W3C recognizes this and refocuses to take feedback from the actual people that use the Web, because if it doesn't, it really has no right to keep claiming it is setting Web standards in the public interest. This image by Kori Feener is licensed under a Creative Commons Attribution 4.0 International License. Based on a work at https://static.fsf.org/nosvn/images/protestors-closeup.png.